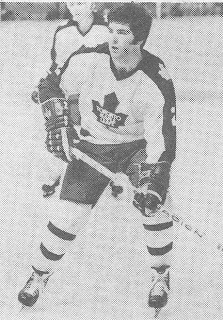 Vintage Leaf Memories - Michael Langlois: What was your favourite Maple Leaf “draft day”? What was your favourite Maple Leaf “draft day”? For expectation, anticipation and excitement in hockey (and for the eternally hopeful Maple Leaf supporters) nothing matches draft day. It seems to represent the epitome of optimism—as in this will be the year we (finally?) draft the kind of difference-makers who will shoot us to the top of the class, and we will become one of the truly elite teams in the National Hockey League. I’ll try to be more succinct than I usually am today: by far, the best Leaf draft day that I remember happened in 1973. Some background may help: the Leafs under then GM Jim Gregory had been building a really good team in the early ‘70s, a nice combination of emerging kids and savvy veterans. We had Jacques Plante and Bernie Parent in goal, a classic combination of potential and experience. Unfortunately, owner Harold Ballard didn’t believe the incoming World Hockey Association would ever amount to anything, so he did not fight to keep half a dozen really good young players who all jumped to the new league before the 1972-’73 season. The team, thusly gutted, had a lousy year. I grabbed a copy of the Globe the day after the draft to read all about it. (It’s not like there was television or radio coverage if you didn’t live in Toronto.) I held on to that sports section for years. There were pictures and quotes from all the new players, thrilled, they each said, to be chosen by the blue and white. I had seen both Turnbull (right, in his playing days with the Leafs) and Neely play as juniors, and while I had some questions about Neely (I thought he was miscast as a would-be tough guy; he actually had a lot of skill for a very big man), I thought getting the sweet-skating Turnbull was an absolute steal. Unfortunately, McDonald was traded by returning General Manager Punch Imlach during the 1979-’80 season. He went on to a Hall-of-Fame career. Turnbull was never quite the sum of his immense skills, though Leaf fans of that time well remember his splendid performance in the 1978 playoffs after Salming was seriously injured. The real purpose of my post today is this, however: what has been your favourite draft as a Leaf fan? Does one year stand out because of a particular selection or a player that was a personal favourite (or turned out to be)? Maybe it was a a big trade or because our scouting staff came up with a number of picks that became useful contributors? The draft is a lot of fun, and evokes great memories for me—but nothing so far compared with 1973. How about you? Favorite Leaf draft day?..Probably 2009. On June 26, 2009, Brian Burke made his first appearance as the Leafs GM at the 2009 NHL Entry Draft and selected Kadri with the 7th pick overall. "Is that the kid you want?" Thought it hasn't been perfect, they didn't ruin the kid. Eakins did manage to groom Kadri into an NHL player. I have since found the plucky little guy easy to cheer for. There was with the marlies moment during the lockout when I saw Kadri instantly throw a 100 foot pass out of the corner and put it right on the tape. I thought to myself, "I don't think there are 50 guys in the NHL that can pass like that." We saw one of those beauties to Kessel against Boston for a goal, so he can do it when it counts. I hope Kadri continues to develop and stays a Leaf. He's just too easy to cheer for. Unless the Leafs make a trade to move up Saturday, it may not be as exciting this time around, DP, but let's see how things play out- there are some good young players out there in the first round (and beyond). Michael, I have two memorable Leaf draft moments. First, Boston's selection of Tyler Seguin second overall in 2010. Second, when Boston chose Dougie Hamilton ninth overall in 2011. I was probably thinking in terms of something a little "happier", Steve, but hey, those are memories! The draft I remember the most was 1994. I was at our cottage painting the beer fridge on a weekend before the draft in a brilliant Maple Leaf blue. My "soon to be" daughter-in-law had made a Maple Leaf template for me to place on the fridge door to preserve a white Maple Leaf crest when I spray painted the blue colour on the rest of the fridge. As we were beginning to paint, one of my other sons phoned and when he learned what we were doing, he requested we also block out a number 17 for the fridge to honour our favorite Leaf- Wendel Clark. Job was done and the fridge was forever known as the "Wendel Fridge". The 1994 draft was a few days after the job was completed and that was when Wendel was traded on draft day for Mats Sundin. Ouch! As good as Mats turned out to be, it sure was an upsetting blow at the time for more reason than just the loss of our favorite player. A memorable draft indeed! (Also a great beer fridge). Hi Not Norm- that really was an exceptional draft for the Leafs. Each of those guys could play, though Neely was never quite used properly. And throw in Hammarstrom and Salming that summer, too, and it was a summer of riches for Gregory. Thanks for chiming in, Not Norm. I certainly remember those days, Michael, when the Leafs had all those young players on the Leafs. I never woke up in the morning without first thinking, "how many days to the next Leaf game?" Also listening on the radio for the away games that weren't televised. "Lanny shoots...he scores". I'm going to give you a different draft memory. I was about 10 years and the year was about 1970. They drafted Daryl Sittler from the London Nationals (Knights), I believe. He didn't wear a helmet then and I'll always remember this tall, skinny centre with long flowing hair skating around like a waterbug. I knew he was bound for greatness for my Leafs. In 1976, my prediction was realized when he scored 10 points (6 goals,4 assist) against my nemisis team, the Boston Bruins. It felt so good to finally rout those Big Bad Bruins. But I did have a little sympathy during that game for the Bruin's rookie goalie, Dave Reese. I don't think he was ever pulled during the game and I wondered how he'd ever live this record performance(by my hero) down. The Sittler selection was fantastic, for sure, drgreg. I, too, fondly recall his early days with the Leafs. An injury impacted his first season, and he played more wing than center as I recall (the Leafs had Keon, Ullman and Harrison ahead of him), but he was a gutsy, hard-driving kid. He just kept getting better and better every season. A great Leaf. We had the same affliction as kids: I also spent a lot of time "planning" around the next Leaf game. Listening to games on the radio was special, indeed. Thanks for visiting, drgreg.